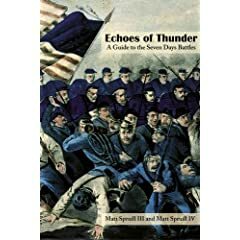 Spruill III and IV: "Echoes of Thunder: A Guide to the Seven Days Battles"
The format of Echoes of Thunder is instantly recognizable, as it’s modeled closely on the Army War College’s series of Civil War campaign and battlefield tour guides. Battle reports gleaned from the Official Records comprise most of the text, with maps and tour directions attached. In fact, one of my major criticisms of the War College series as a whole—in terms of their practical usefulness as field guides anyway—is the inclusion of so much text (often hundreds of densely packed pages). It is difficult to enjoy a battlefield tramp and appreciate the subtleties of the terrain—let alone enjoy the sights, sounds, and smells of nature—with your head buried in a book the entire time. There is a balance to be struck, and the Spruills do a much better job than others have done of constructing a guide useful for both touring and reading at home. Author commentary and tour directions are provided in gray box sidebars that can serve on the battlefield tour itself as substitutes for reading the full text of the O.R. reports and other lengthy primary accounts associated with each of the guide’s tour stops. I only wish the authors had elected to include a bibliography to demonstrate what sources were consulted beyond the official reports and excerpts recreated in the text. In Echoes of Thunder, 55 maps cover the main battles of the Seven Days Campaign—Beaver Dam Creek, Gaines’s Mill, Savage Station, White Oak Swamp, Glendale and Malvern Hill. The authors chose to leave out the June 25 battle at Oak Grove, but they do include a tour of “Stuart’s Ride Around McClellan” as an appendix. The maps themselves are quality efforts, incorporating elevation contours and relevant terrain features like roads and streams (but unfortunately no on map scale). Helpfully, while tactical and operational maps detail troop movements over period terrain, modern maps are provided to guide the reader to each of the book’s 30 tour stops. Additionally, an order-of-battle for each side, casualty numbers by battle, and the locations of the national cemeteries in the area are included as appendices. With its detailed maps and practical structure and organization, Echoes of Thunder should prove to be a very useful guidebook for any reader interested in touring the sites of the Seven Days battles. Winter Lightning: A Guide to the Battle of Stones River by Matt and Lee Spruill (University of Tennessee Press, 2007). Spruills (however many there are...3+?) must descend from an ancient family of tour guides. When the Texans Came: Missing Records from the Civil War in the Southwest, 1861-1862 by John P. Wilson (University of New Mexico Press, 2001). This is a lengthy treasure trove of source materials -- reports, diaries, letters, sketches, casualty returns, newspaper articles, etc. It's a very nice quality hardback as well; how the publisher managed a $12.95 list price is beyond me. The Civil War in St. Louis: A Guided Tour by William C. Winter (Missouri Historical Society, 1995). This is an exceptionally good history and guide book; exhibiting a number of great maps, illustrations, and photographs in addition to the deep text. Like Men of War: Black Troops in the Civil War, 1862-1865 by Noah Andre Trudeau (Castle Books, pb reprint, 2002). If you had to chose one book to best inform yourself about the military experience of USCTs this would probably be the one. 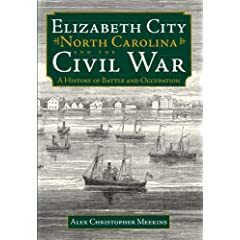 Meekins: "Elizabeth City, North Carolina and the Civil War"
The last decade has witnessed an explosion in city, county, and regional studies. The myriad of reasons why are beyond the scope of this review, but these provide perhaps the best laboratory for the study of Southern Unionism and the guerrilla warfare that invariably breaks out in areas with concentrated unionist populations. Both subjects are strongly local in terms of motivating factors and characterization. Alex Christopher Meekins' study Elizabeth City, North Carolina and the Civil War is very much in this vein. The region of interest is that part of North Carolina bounded by the Chowan River (west), Albemarle Sound (south), Currituck Sound (east), and the Virginia-NC border (north). While more regional in nature than indicated by the title, this study nevertheless directs much of its focus upon the Pasquotank River port of Elizabeth City. It's initial capture by Federal army and navy forces in early 18621 inaugurated a period of alternating occupation and economic devastation. Meekins recounts in great detail the broad destruction wrought by the guerrilla (and counter-guerrilla) warfare that engulfed the area during 1862-1865. The various strategies employed by the succession of Union district commanders to stem the violence over this period are detailed. Significant unionist feeling in NE North Carolina led to the Federal army's recruitment of both white and black combat units. The uncertain economic viability of the region and issues of physical safety among the citizens are important elements of Meekins's study. In fact, as in many other regions of the occupied South, Union forces used economic incentives as a means to curb guerrilla attacks. Regardless of such efforts, rampant guerrilla warfare, combined with only periodic occupation by regular forces, led to a citizenry constantly under the gun, assaulted and exploited by both sides (regardless of allegiance). The publisher has done a fine job as well; the paperback volume is sturdily constructed using quality materials and is handsomely illustrated. Written well and based almost exclusively on primary source materials, the book's strengths are abundant; however, several weaknesses are apparent. While notes indicate a deep level of original research, no bibliography or index are provided. Three maps2 are present, but, with so many locations mentioned in the text but not found on any map, much needed detail was lacking3. None of these flaws, however, would deter me from recommending this study. 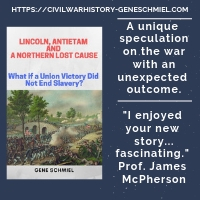 Beyond its role as an original, gap-filling regional history, Elizabeth City, North Carolina and the Civil War contributes significantly to the expanding literature examining broader issues of Southern Unionism [black & white] and guerrilla warfare. 1 - This event is only briefly covered. Military coverage focuses primarily on the occupation, with its attendant guerrilla warfare and cavalry sweeps. 2 - An 1893 map of Elizabeth City; and two regional, large-scale archival reproductions dating from 1867 -- one a magnification of the other. 3 - I have always been of the fervent opinion that original maps, wedded to the text, are a must for all modern studies. "Firearms in American History: A Guide for Writers, Curators, and General Readers"
Confusion abounds in the Civil War literature when it comes to the detailed discussion of weaponry. While the pistols and long arms of the 1860s comprise only a segment of its coverage, Firearms in American History: A Guide for Writers, Curators, and General Readers [by Charles G. Worman (Westholme, 2007)] should serve as an excellent quick reference guide for Civil War writers. I centered my own reading on the 1840-1865 period, and was impressed with the author's ability to effectively convey a great deal of detail (technological background, production info., weapon specs, strengths, weaknesses, etc.) in a small amount of space, while at the same time keeping broader trends in focus. Looked for information is also easy to find, a feature critically important for a good reference work. The volume also swarms with clearly reproduced B&W photographs, while sturdy binding and the use of a heavy weight, high gloss paper ensures durability. Firearms in American History is a top notch production overall, and Charles Worman's encyclopedic historical survey will undoubtedly be much referred to during my own inquiries. Cooling: "Counter-Thrust: From the Peninsula to the Antietam"
Counter-Thrust: From the Peninsula to the Antietam is the tenth volume to be released from the University of Nebraska Press's Great Campaigns of the Civil War Series. Author Benjamin F. Cooling has always been a great writer of historical narrative, but what makes his latest effort a wonderful addition to the series is the expert manner in which he mines the literature for the best scholarship the subject has to offer, dissects the findings, and concisely reprocesses it for the benefit of a wide range of readerships while at the same time injecting his own insightful analysis. Cooling does a nice job of placing his account of the eastern theater within the broader military and increasingly radicalized political backdrops. Concurrent with Lee's military campaign were other important Confederate counter offensives. Bragg and Kirby Smith advanced into Kentucky while Van Dorn and Price targeted Federal forces in northern Mississippi. Mention is also made of lesser known campaigns, such as the massive recruiting drive in Missouri and Loring's Kanawha Valley offensive in western Virginia. On the social and political fronts, the author documents the period's intensifying debates over slavery and the institution of a harsher brand of warfare, including the Confiscation Acts and the emancipation efforts of the more radical elements of the legislature. Of course, Lincoln himself was mulling over his preliminary Emancipation Proclamation during this period. Cooling raises a point often overlooked by many writers, that of a rather sharp east-west disconnect when it came to the U.S. army's application of "hard war". Particulars that provoked lively debate in the east were perhaps old news to western civilians1. Was it hypocrisy or a practical reaction to differing military situations across theaters? Cooling suggests that an earlier, widespread southern reliance on irregular warfare was the main reason behind this initial 'hard war in the west/soft war in the east' duality2. 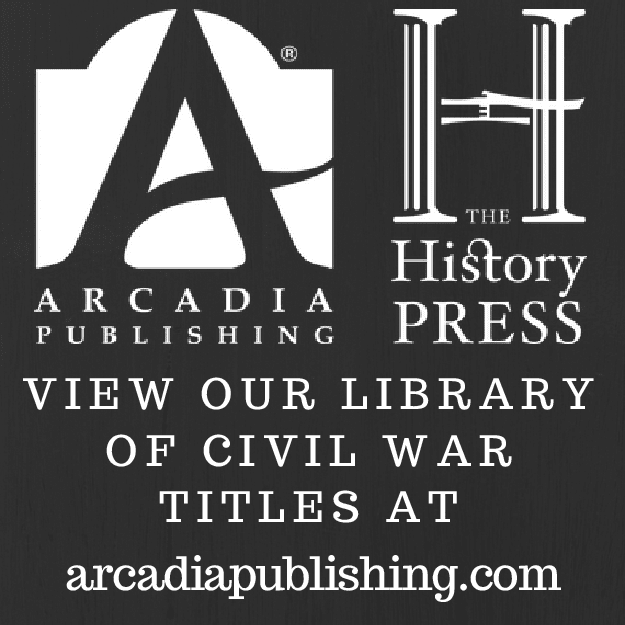 At their heart, the volumes that make up the Great Campaigns of the Civil War Series are works of scholarly synthesis. Cooling certainly takes this to heart, providing frequent quotes from or summarizing the results of the best of current scholarship3. However, while this does bring the reader up to date in terms of scholarly thought and trends, for the smaller points Cooling is often satisfied with simply providing the message without offering his own critique. On the other hand, for the larger controversies, the author examines them with a steady, even hand. One of the greatest subjects for debate is the alleged slowness of McClellan in forwarding reinforcements to Pope. Of course, McClellan could have sent elements of the Army of the Potomac more rapidly, but they would have arrived in comparative dribbles, deficient in cavalry and artillery. Instead, the general sought to concentrate any reinforcements before sending them forward to Pope. Regardless of what one my think in hindsight of the advisability of throwing caution to the wind, given the intelligence fog McClellan was operating under (with no helpful direction from a harried, confused Halleck or a stubbornly ignorant Pope), it is difficult to continue to argue that his actions were unreasonable. Critics, then and today, also underestimated the vast difficulties in transporting the Army of the Potomac from Harrison's Landing to northern Virginia. Rapidly moving an entire army of close to 100,000 men, plus all the horses, wheeled transport, and artillery (not to mention the thousands of sick and wounded) is an enormously difficult logistical feat4, and Cooling asserts that McClellan did indeed move with all due speed in this regard. On the other hand, the wording of McClellan's dispatches did little to inspire the confidence of Lincoln and a frazzled Halleck. Given the series' emphasis on the intersection of politics, society, and warfare, it is perhaps not surprising that more space, historiographical background, and analytic thrust is devoted to the Lincoln-Halleck-Pope-McClellan relationship than the partnership between Lee and Davis. The role of Jefferson Davis in these events is largely relegated to the shadows. On the whole, and probably in keeping with the larger mandate of the series, no truly major revisionist themes were detected. Like most writers, Cooling can be quite rough on McClellan, but he is much fairer than most, and does not shrink from praise when due. Although detailed tactical studies (some definitively so) exist for the battles of Cedar Mountain, Second Manassas, Chantilly, South Mountain, and Antietam; B.F. Cooling is the first author to attempt a multi-faceted, single volume synthesis of the current literature for this fluid period. Counter-Thrust is a great addition to Nebraska's Great Campaigns of the Civil War Series, and should serve as a valuable summary for beginning students and specialists alike. 1 - Pope's infamous threats against civilians in Virginia should have come as no surprise, as the general invoked the same harsh policy (and followed through with it) many months earlier in NE Missouri. 2 - The point should be made that the 'bushwhacking' brand of irregular warfare was hardly a distinctly Confederate trait during this period--a pro-Southern citizen along the Missouri-Kansas border, or a Confederate soldier transiting the wilds of NW Arkansas, East Tennessee, West(ern) Virginia, and SE Kentucky during 1861-62 will express similar indignation. 3 - Helpfully to those interested in further reading, Cooling names these historians directly in the text. No resort to "a prominent historian has suggested...", forcing the reader to refer to the notes, where the scholar's identity may or may not be revealed. 4 - It should be mentioned that it took many weeks to piecemeal shuttle the army to the peninsula in the first place; the reverse process (with all its new difficulties) might arguable be considered no easier, even after taking into account efficiencies gained through experience and the accumulated resources available. Vital Rails: The Civil War History of the Charleston & Savannah Railroad by H. David Stone (Univ. of South Carolina Press, 2008). I've been following this one for a while (here) and can't wait to dive into it. A beautiful book as well. Recently, Dimitri posted some interesting perspective after reading the galley. Lincoln and Douglas: The Debates that Defined America by Allen C. Guelzo (Simon & Schuster, 2008). With the 150th anniversary of the Lincoln-Douglas debates coming this year, a number of books aiming for broad consumption have been released already..with more surely to come. I would imagine that this one will be at or near the top when all is said and done. Frontier Defense in the Civil War: Texas' Rangers and Rebels by David Paul Smith (Texas A&M Univ. Press, 1994). 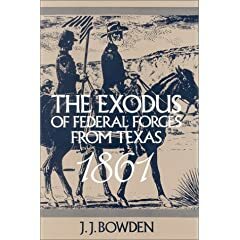 This is an essential addition to any Civil War Texas library. A much belated one to my own. Missouri's Confederate: Claiborne Fox Jackson and the Creation of Southern Identity in the Border West by Christopher Phillips (University of Missouri Press, 2000). I am an admirer of Phillips's biography of Nathaniel Lyon, and am looking forward to his examination of Missouri's 'other side of the coin'. 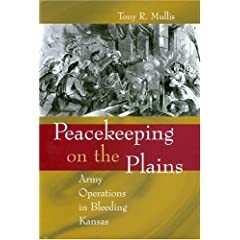 Peacekeeping on the Plains: Army Operations in Bleeding Kansas by Tony R. Mullis (University of Missouri Press, 2004). Original in focus and intrigued by the perspective arising from the author's professional background, I've been wanted to read this one since its publication. Lincoln and the Decision for War: The Northern Response to Secession by Russell McClintock (University of North Carolina Press, 2008). I was a little premature in listing this arrival back in January. I am greatly looking forward to this one. So many secession studies concentrate on the viewpoints of the radical elements of Confederate society and the response of the Lincoln administration. More recently, Nelson Lankford expanded our regional understanding with his excellent discussion of the debates among influential thought leaders of the Upper South. Hopefully, McClintock's book will provide us with a broad cross section of northern opinion. Campaign in Western Virginia by George B. McClellan (Mark S. Phillips Publishing, 2007). I've commented on this one already (here). It can also be found at one of my favorite regional publishers, The West Virginia Book Company. Bloody Dawn by Thomas Goodrich (Kent State Univ. Press, 1991). In my opinion, this is the best historical account of the "Lawrence Massacre". Among Goodrich's many publications, it is also his most detailed and complete book (IMO, anyway). Wife, Deb Goodrich, has a feisty, entertaining blog with a fair amount of Civil War content as well. Civil War Tours of the Low Country: Beaufort, Hilton Head, & Charleston, South Carolina by David D'arcy (Schiffer Publishing Ltd., 2008). I caught this one from an entry on Dimitri's Civil War Book News a short while back. Not sure what to make of it (or its predecessor below) yet. The emphasis appears to be on antebellum architecture [D'arcy is a real estate professional so the focus isn't surprising]. Civil War Walking Tour of Savannah by David D'Arcy & Ben Mammina (Schiffer Publishing Ltd., 2006). Sutherland (ed. ): "Guerrillas, Unionists, and Violence on the Confederate Home Front"
As with his other edited essay collection [here, with Anne Bailey] published by UA Press, Daniel Sutherland's work on Guerrillas, Unionists, and Violence on the Confederate Home Front demonstrates his great knack for matching authors with subjects and subjects with the general theme at hand. In this case, the broad meaning of Southern Unionism and the violence attached to its promotion and suppression are examined. Sutherland launches the book with a nice general introduction to the current state of scholarship and summarizes the essays to follow. Victoria Bynum kicks it all off with her inquiry into Mississippi's "Free State of Jones", and how views of the nature of the resistance changed over time in the literature. In his study of violence in North Georgia, Jonathan Sarris notes how citizen appeals for legal redress through established channels evolved over a period of escalating disorder. Lesley Gordon studies the primary issue raised from the "Great Hanging" at Kinston, NC--should a deserter from the Confederate army who subsequently enlists in the Union army be accorded the usual rights and protections of a POW? John Wakelyn takes up the issue of personal threats and political coercion by Unionist pamphleteers in Virginia. Daniel Sutherland also takes the reader to Virginia and remarks upon the relative lack of violence that occurred in Culpeper County. His study of motivating factors makes note of an important demographic feature not often taken into account, age. Noel Fisher traces East Tennessee Unionism through Reconstruction, while B.F. Cooling determines that guerrilla warfare became the defining experience of the majority of soldiers and civilians in Kentucky and Tennessee starting with Grant's capture of Fort Donelson. Moving on to the Trans-Mississippi front, David Paul Smith examines the violent suppression of Unionists and anti/ex-Confederates in North Texas. Donald Frazier summarizes the guerrilla conflict in Louisiana, while Robert Mackey traces the strategies behind the successful Federal counter-guerrilla campaign in Arkansas. Finally, Michael Fellman relates the horrors of guerrilla violence through graphic first person accounts, and discusses how this archival research affected him on a personal and professional level. Another significant hallmark of a Sutherland edited book is that, unlike so many other essay collections, there are no weak links [although the Fellman article at the end seemed a bit out of place]. Each article stands alone as a worthy contribution to the literature, yet they complement each other like pieces to a puzzle. In this volume, the regions of the South with the largest concentrations of Unionist sentiment are well covered, with the notable exception of Florida. This is rather unfortunate, as Florida's internal civil war (especially on the Gulf Coast) deeply divided its citizens, as much as any Confederate state. So, what is Southern Unionism? Like most of the great questions from the war period, its roots and expression do not readily admit to reducible answers. Conscription, impressment, war weariness, taxes, confiscation, political affiliation, ideology, religious identity, familial connections, regional ancestry, class conflict -- all are factors that inspired Unionist, or at least anti-Confederate, sentiment during the war. In terms of expressing their convictions, Unionists could be passive or active, pro-slavery or anti-slavery, or just anti-government altogether. While these essays gathered by Sutherland wonderfully elucidate these questions in terms of individual and community motivation, they amply remind us of the impracticality of broad generalization. Briefly - "Campaign in Western Virginia"
In 1863, in the spirit of defending his wartime actions against critics, George McClellan penned his Report on the Organization and Campaigns of the Army of the Potomac. To this report was appended a brief account of his 1861 Western Virginia campaign. This year Mark S. Phillips Publishing has reprinted this volume with some added materials [reproductions or scans of selected letter and telegraphic communications; an index; and an afterword by Tim McKinney, a frequent writer of West Virginia Civil War history]. McClellan's account doesn't differ significantly from the standard modern view of the campaign. While he probably doesn't give subordinates (esp. Kelley, Cox, and Rosecrans) the praise they deserve for overcoming so quickly the steep learning curve attached to the handling of brigade and division-sized units, the only truly unfair note is struck in his assessment of Rosecrans's actions at Rich Mountain. There are some interesting contradictions that remain unclear, but it's possible they stemmed from changing circumstances the general passed by without note. While the report isn't annotated, McKinney does provide some background and general commentary in the afterword. For researchers, Campaign for Western Virginia is an essential primary account of an important early war campaign from a high command point of view. No word as of this writing on the official website, but a NYT brief mentions that the 2008 Lincoln Prize for American History winner(s) are James Oakes for The Radical and the Republican: Frederick Douglass, Abraham Lincoln, and the Triumph of Antislavery Politics and Elizabeth Brown Pryor for Reading the Man: A Portrait of Robert E. Lee Through His Private Letters. 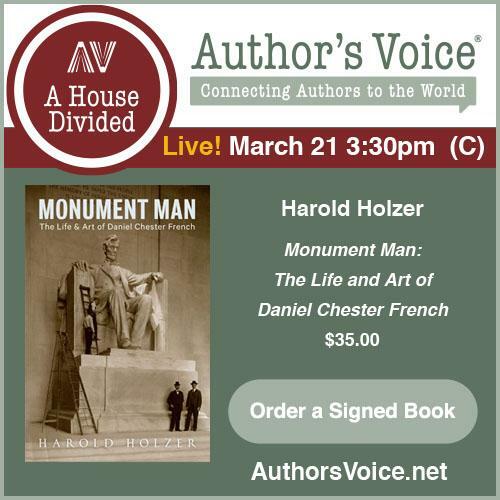 The article notes that each author will receive $20,000 and a bronze bust. [I wonder where the extra $10,000 went... (Douglas Wilson got $50,000 for winning the 2007 award)]. I haven't read either one, though Pryor's book is amoulderin' on the shelf. Every once in awhile, I glance over at it and its girth, thinking to myself I could read three books I would probably enjoy much more in the time it would take me to get through that one. Watson & Brantley: "Confederate Guerrilla Sue Mundy"
Confederate Guerrilla Sue Mundy is not a traditional biography of its subject, Morgan Raider turned bushwhacker Marcellus Jerome Clarke, but rather a meticulously detailed recounting of the guerrilla warfare that raged across large swaths of north-central Kentucky in the latter months of the war. While "Sue Mundy" is certainly the focus of this study, the narrative also closely follows the exploits of equally well known comrades-in-arms, men such as Samuel "One Armed" Berry, Stanley Young/"Bill Marion", and Henry Magruder. Even William C. Quantrill, who crossed into Kentucky from Missouri with a sizable band of followers, features prominently. The "Sue Mundy" persona was a fictional creation of Louisville Journal newspaperman George Prentice. While the various myths and legends attached to Mundy are discussed in various places throughout the text, I believe the reader would have benefited more from a concentrated, systematic approach. What Prentice hoped to accomplish and the contradictory manner in which he went about trumpeting his creation, was confusing to say the least. A section of the epilogue does address at some length the issue of Mundy's dress [no, Clarke never did outfit himself in women's garb]. What the notoriety did ensure was Clarke's execution if captured, which is exactly what happened. Readers might be surprised at the intensity (and relative inpunity) of the guerrilla raiding so close to a major Union garrison city such as Louisville. Watson and Brantley illustrate this vicious brand of warfare very well, characterized all too often by lawless plundering and murdering of civilians with only secondary concerns for organized efforts against enemy military detachments. Federally supported countermeasures could be equally ruthless, with Union General Stephen Burbridge executing dozens of Confederate prisoners (regular military POWs and political detainees) in retaliation for the killing of U.S. soldiers and pro-Union civilians. Paramilitary groups [labeled 'decoy guerrillas' by the authors] were also sanctioned by Federal authorities, with predictable results (Ed Terrell's gang being one of the prime examples of the cure being as bad as the disease). While Watson and Brantley's balanced and well organized depiction of these events has clear intrinsic value, the authors largely pass on the opportunity to analyze in depth their guerrilla subjects through the broader lens of Kentucky politics, society, and community conflict. The bibliography size and diversity of source types consulted is limited. Citations from several chapters indicate an almost complete reliance on court martial papers, prompting one to wish for more explanatory notes detailing their use. Additionally, personal interviews were frequently cited, without indication of whether further documentary research was undertaken to corroborate the information*. The secondary sources consulted by the authors are older works. In terms of presentation, while the absence of maps is unfortunate, a very nice array of rare photographs (many previously unpublished) were included. 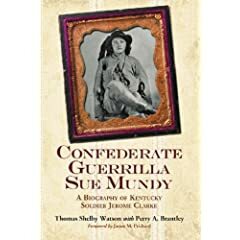 Above concerns aside, Confederate Guerrilla Sue Mundy is nevertheless a notable contribution to Kentucky's Civil War library. I am not aware of any other study of guerrilla warfare in this region of the state that even remotely approaches the level of detail uncovered by authors Thomas Watson and Perry Brantley. The resulting study is not definitive, but it's framework provides a very welcome and needed start. * - As a side note, the authors discovered several interesting documents held in private hands, to include poetry purportedly written in the hand of William C. Quantrill. With Richard C. Peterson, Kip Lindberg, and Keith Daleen, Sterling Price's Lieutenants: A Guide to the Officers and Organization of the Missouri State Guard, 1861-1865 (Two Trails, new revised ed. 2007/2008). ed., General M. Jeff Thompson's Letter Book July 1861-June 1862 (Two Trails Publishing, 2004). Campaigning With Marmaduke: Narratives and Roster of the 8th Missouri Cavalry Regiment (Two Trails, 2002). ed., Letter and Order Book, Missouri State Guard 1861-1862. (Two Trails, 2001). Missouri Confederates: A Guide to Sources for Confederate Soldiers and Units 1861-1865 (Two Trails, 2001). ed., Service with the Missouri State Guard: The Memoir of Brigadier General James Harding (Oak Hills Publishing, 2000). ed., Voices of the Swamp Fox Brigade: Supplemental Letters, Order and Documents of General M. Jeff Thompson's Command, 1861-1862. (Blue and Grey Bookshop, 1999). ed., "Tales of the War": A Series of Civil War Articles From the Daily Missouri Republican St. Louis, Missouri 1885-1887.
ed. with James R. Mayo., Stoddard Grays: Confederate Soldiers of Stoddard County, Missouri, 1861-1865. (Two Trails, 1995). DW: Hello, Jim. Thanks for taking part in this little author Q&A session. How long have you been researching the Civil War in Missouri? Has it always been your sole research interest? JEM: Like most people probably, my interest in the war began by reading about the war in the east. In fact, I still read some books about the eastern theater. I stumbled across Jay Monaghan’s Civil War on the Western Border about 1964 or so while I was stationed at Lowery AFB in Denver. That sparked my interest in the war in Missouri. Thus, since the mid-1960s I have concentrated on the war in the Trans-Mississippi, especially the people and events in Missouri. I am completely fascinated with the subject. DW: Your latest book Guide to Missouri Confederate Units, 1861-1865 (U. of Ark. Press) is scheduled for release this April. What is it you wanted to accomplish with this project? JEM: Missouri Confederate units are confusing to say the least. What I set out to do, and I hope I have succeeded, is to sort out the myths and realities of Missouri’s units, and to provide a brief historical summary of the service of each unit, that will assist historians and genealogists alike in their research. DW: In what ways does your book go beyond the model of the Confederate state unit guide established by Art Bergeron's excellent Louisiana study and Stewart Sikakis' many volumes? JEM: Sikafis’ books provide very little detail regarding the units he includes. My book, like Bergeron’s, gives more information on the organization, officers, casualties, etc., of each unit. As a matter of fact, I modeled my book after Bergeron’s, which I consider by far the best of the genre. DW: Was it difficult to find a publisher? Was it your original intention to go with a university press? JEM: I didn’t know if anyone would want to publish the manuscript! It never occurred to me that a university press would have any interest in it, so I considered a small press or even self-publishing. Dr. Bill Gurley, who co-edited the wonderful McPheeters diary published by the University of Arkansas Press, read my manuscript and suggested submitting it to Arkansas, since they publish the ”Civil War in the West” series. I was pleasantly surprised when the press accepted the manuscript for publication. DW: You once told me you try to obtain a copy of every book published about the CW in Missouri for your home library. I won't ask you to pick favorites, but could you briefly discuss a few books you have found to be excellent, but remain most undeservedly obscure even to those well steeped in the Missouri literature? JEM: A fairly recent release, Fishing in Deep River: Civil War Memoir of Private Samuel Baldwin Dunlap, C.S.A., despite its unfortunate title, is a wonderful memoir of a northwest Missouri soldier that recounts his experiences in the Guard and as an artilleryman with the 1st Missouri Brigade. Daniel Joseph Plaster’s Marmaduke’s First Missouri Raid, 1862-1863: The Roles of Federal Scouts and Outposts in the Defense of Springfield, is a fine study of small unit operations during General Marmaduke’s initial raid into Missouri. Finally, Gary Scheel’s, Sixty-Six Miles in Thirty-Nine Hours: The Retreat from Fort Davidson, Pilot Knob to the Battle of Leasburg, provides an interesting account of a little known incident connected to the battle at Pilot Knob. DW: Great, I'll definitely need to visit those first two. Interestingly, you mention in the intro to your MSG order book compilation that there is far more source material available than is commonly believed (albeit widely scattered). Where are the best places to look for primary source material related to the MSG? JEM: The Missouri State Archives, the Western Historical Manuscript Collection at the various campuses of the University of Missouri, the Missouri Historical Society (St. Louis), Wilson’s Creek National Battlefield Park, various county historical societies in Missouri, and in private hands. Quite frankly, if I might promote another of my projects, the best starting place for locating Missouri State Guard resources is the extensive bibliography of the Guard in the second edition of Sterling Price’s Lieutenants. DW: As a long time observer and contributor, what project would you most like to see? On a similar note, what do you feel is the most neglected subject in the literature? JEM: I would love to see a single volume history of the war in Missouri, biographies of Samuel Curtis and Francis M. Cockrell, and comprehensive studies of the siege of Lexington and Price’s Expedition of 1864 (from the beginning to the bitter end!). As for neglected subjects, there is a serious dearth of modern regimental histories of Missouri units, both Union and Confederate. DW: And of the good ones that do exist, none that I can recall are of regiments that did not do the bulk of their service in the western theater. I have high hopes for Michael Gillespie's ongoing Lexington project. For me, the Missouri State Guard is the most fascinating Civil War period military organization. My personal dream project would be a complete military history of the MSG. Given your knowledge of the available source material, would such a project be feasible? JEM: I believe it is. There are some aspects of the Guard that are short on primary materials, the battle of Athens being one, but I think that a comprehensive history of the Guard could and should be done. There are many important resources available that have never been used by historians. DW: What is your biggest lament in terms of the overall state of scholarship dealing with CW Missouri? JEM: Initially, the lack of interest in the war in Missouri by most professional historians in the state is absolutely shameful. Non-academics have accomplished much of the research and writing about the war in Missouri over the past several years. Secondly, the emphasis on guerrilla warfare in the state has been overdone to the detriment of other aspects of the conflict. How many more times must we ride with Quantrill and Bloody Bill? I, for one, am extremely saddle-sore. DW: Along with the overemphasis issue, much of the output dealing with the guerrilla war aspects continues to be unhelpful (to put it kindly) as well. It is my hope that University of Missouri Press will someday champion a broader and deeper contribution to Missouri CW literature, similar to the effort Tennessee is doing for the western theater and Appalachia. JEM: I am currently working on a compilation of first hand accounts of the battles of the Missouri State Guard. Tentatively titled "A Missouri State Guard Reader". DW: That sounds like it would be a great resource. Thanks again for your time, Jim, and for giving me some new ideas to mull over and books to find. 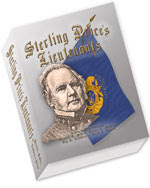 Readers, if you'd like to purchase a copy of the new edition of Sterling Price's Lieutenants, go to the publisher's website (link-scroll down). Also, keep an eye out for the April 08 release of Jim's Guide to Missouri Confederate Units, 1861-1865 (U. of Arkansas Press). As always, I will keep you posted. McGrath: "Shepherdstown: Last Clash of the Antietam Campaign"
Shepherdstown is the first full treatment of the two day battle that effectively ended the 1862 Maryland Campaign. It would not be a great stretch to call author Thomas McGrath's detailed military history and tactical analysis of the fighting a definitive effort. Partly due to leadership blundering from both sides, the Battle of Shepherdstown was an unusually sharp rear guard action, fought amidst the clifftops, ravines2, and open fields surrounding both ends of the Potomac River crossing at Blackford's (Boteler's) Ford. As McGrath very ably illustrates, the September 19th fighting was a prime example of the superiority of Federal artillery and the dismal leadership of Army of Northern Virginia reserve artillery chief William Nelson Pendleton. On the Virginia side of the river, the next day witnessed a progressively severe battle develop between A.P. Hill's division and two advanced brigades of Fitz John Porter's V Corps. From the Union side, a large part of the Shepherdstown fight, and an unwelcome measure of its tragedy, was borne by the 118th Pennsylvania, a nearly full-strength infantry regiment experiencing its first combat. Left behind when the rest of the V Corps regiments withdrew back to Maryland in the face of Hill's counterattack, the Corn Exchange Regiment suffered severe losses. McGrath's illuminating account of the 118th's harrowing experience could be considered the centerpiece of his narrative history of the battle on the 20th. As mentioned by participants, the battle had a "Ball's Bluff" feel, except, in this case, massive Union artillery support facilitated a far more orderly Federal withdrawal. Following the modern convention, McGrath skillfully integrates a multitude of personal accounts (both military across ranks and civilian) into his narrative. While his writing style utilizes overlapping viewpoints in places, I didn't find the repetition overbearing. The author also avoids overuse of lengthy block quotes3. In addition to constructing a good battle history, McGrath does a fine job of inserting Shepherdstown within the context of the Maryland campaign and in the immediate aftermath of Antietam. Early in the book, a wonderfully vivid picture is painted of the impact of the campaign on the civilians of Shepherdstown, their private and public resources already overtaxed by passing stragglers and casualties from South Mountain, even as the battle of Antietam raged a short distance away. Overall, Shepherdstown provides precious little to complain about beyond some niggling proofing errors; but I do have some issues with the volume's cartography. While maps are numerous (sixteen by my count, and indeed helpful in unit placement relative to each other), detail is spare overall and the landscapes are unusually stark. The four appendices [to include an OB, KIA list, and contemporary commentary on the weather and the artillery bombardment] are useful. Numerous photographs of officers and men, along with a number of period and modern landscape images, further enhance the text. With his book Shepherdstown: Last Clash of the Antietam Campaign, Thomas McGrath has crafted an original contribution to the literature of the Maryland Campaign. The level of research and the detailed analysis provided is more than satisfactory, while the pleasing writing style is a welcome bonus. Dedicated students, especially those mainly interested in the military aspects of the campaign, will want to obtain a copy of this book. 1 - the direct link is now active (go here or click on title above). 2 - The terrain abutting the river is startlingly rugged. If you haven't done so already, check out Ranger Mannie's photo tour. The book itself includes a nice array of photographs as well. 3 - I realize this is largely a matter of taste, but in narrative settings I prefer thoughtful editing rather than reproduction in full for the most part.